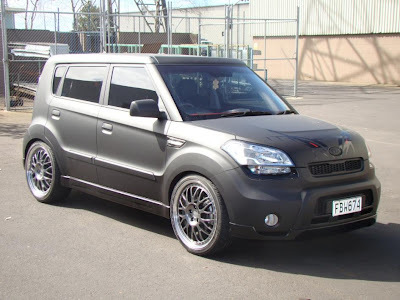 The Kia Soul is being sold all over the globe, including in New Zealand. 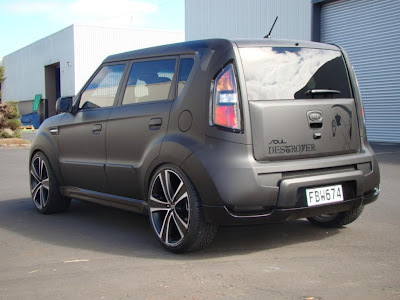 Kia NZ built the Soul Destroyer as a promotional vehicle. The car has a flat-black finish with custom graphics, Autolign lowering springs (down an inch in the front; 1.6" in the rear), a body kit, leather interior, and some big custom wheels that are different on each side of the car. This is definitely the meanest looking Soul I've seen thus far. I think the matte paint on this car is perfect. The Soul was my first choice car in the fall of '08, and I waited patiently for it to come to the U.S. in March of this year. While I waited, I became aware of the Accent SE hatch, and casually gave it a look. I had already considered the Rabbit, Suzuki SX4, Mazda3, Yaris, Fit and the Kia Rio5. I saw the Soul twice, and really liked it. It was larger than I thought it would be, and had a ton of features. In the end I got the Accent SE, and have no regrets, but the Soul should not be over-looked. Kia already has sold a good amount of Souls, too. It think it's a hit. I see a lot of them here in Portland. If you mean Portland Oregon, my birthplace, I'm glad to hear it. The ESC and traction control should come in handy in the rainy weather. I have only seen two so far in Central California.